Hello friends and welcome to the Roller coaster Tycoon Touch tips and tricks guide. This guide is designed to help give some helpful insight on the game and how to further yourself while playing it. Roller Coaster Tycoon Touch is a mobile adaptation of the highly popular Tycoon series. The whole point of the game is to build your own roller coaster theme park. The biggest thing to note about this game is that it is extremely simple. There is no real difficult learning curve for this game and anyone can pick up and play it with little to no experience. You start off in a small tutorial that explains all the basics of the game. 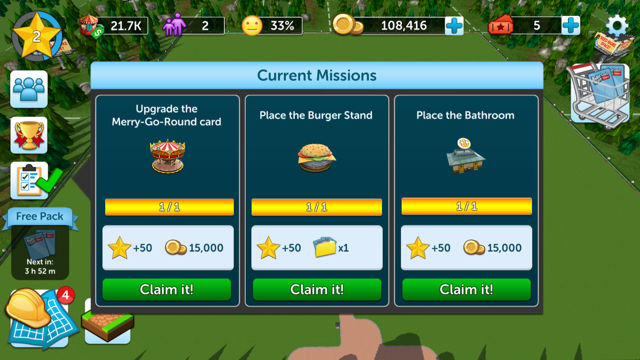 How to get park pieces and place them in your park and how to level up already set pieces and so on. Once you pass the tutorial you are pretty much in your own sandbox on how you want to proceed with your theme park. You still only have a few items you can use for your park so you’re gonna want to get more. The easiest way to unlock more park items is to collect your free packs which you get rather easy. Some are just given to you for logging in every day while others you get for watching ad’s provided by the game. Most packs come with 3 different items inside while some special ones can give you up to 5 items. The whole point of getting packs is to get enough parts to start expanding your theme park area. When you get new pieces it’s great cause you can start placing them wherever you want. But if you pull a part you already have that is also a very good thing. Obtaining a piece that you’ve already placed in your theme park gives you the option to upgrade that specific building. Once it’s upgraded it’ll generate more gold for you and give a better place in your theme park. So when you’re pulling for packs you want to get new pieces but it’s also good to get ones you already have. Upgrading is a big part of this game so utilize it well. So the most important part of this game is also the most basic. Building your theme park the way you want it to be with all your new theme park pieces. Once you’ve gotten some packs and have a handful of new items you want to start placing them around your theme park. Set up buildings like the Merry go round and the hot dog stand. Make sure you connect each building to the park entrance so they can be fully activated. It’s a real simple thing you learn how to do in the tutorial. But once you’ve got buildings and have obtained more pieces you can get to the real reason anyone plays this game. Building your very own roller coaster. The fun thing about Roller Coaster Tycoon is that you can pretty much build them in anyway you see fit. You can add loops, cork screws, and make them as big as you want. It’s a complete sand box allowing you to set things up how ever you want to. All you have to do is get the pieces of the roller coaster you want to build and start shaping it up in your theme park. As you build up your park you’re going to start making gold from having different buildings set around your area. All buildings generate gold for you and the higher they’re upgraded the more they give. This is why upgrading is so important cause upgrades give more gold and gold lets you upgrade your buildings even more. And the more you upgrade the higher your level will get. So make sure you set out as many buildings as you can and upgrade them when ever you can. You want to start generating gold as early as possible so it can build up over time. Once your buildings start upgrading your level will increase with them and unlock more card packs for you to use. The higher your level goes the more items you unlock. So you want to upgrade your buildings, you also want to do missions to get more experience for your levels. Once you get high enough you’ll have a wide expanse of items at your disposal. 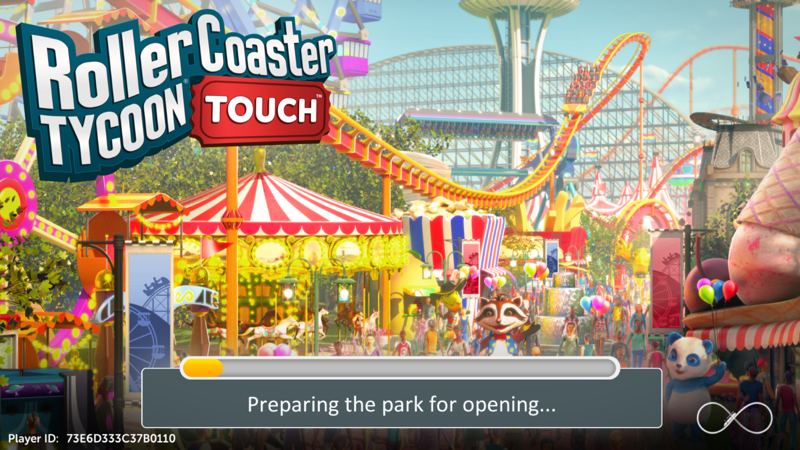 Now Roller Coaster Tycoon Touch is a fun little game that’s easy for anyone to pick up and play. But I will say compared to its previous PC counter parts it is very limited on what you can and can’t do. It’s fun to mess around in and is a great time waster so if that’s your style of play then you’ll really love this game. It’s ability to build how you want and keep you busy is pretty good for an iOS game. I’m not sure you played this game. You have to finish a roller coaster loop before it will run- no hurtling cars off into the void. Also, you can’t buy card packs with gold. And you can’t buy pieces straight out with gold- you need to have the cards. 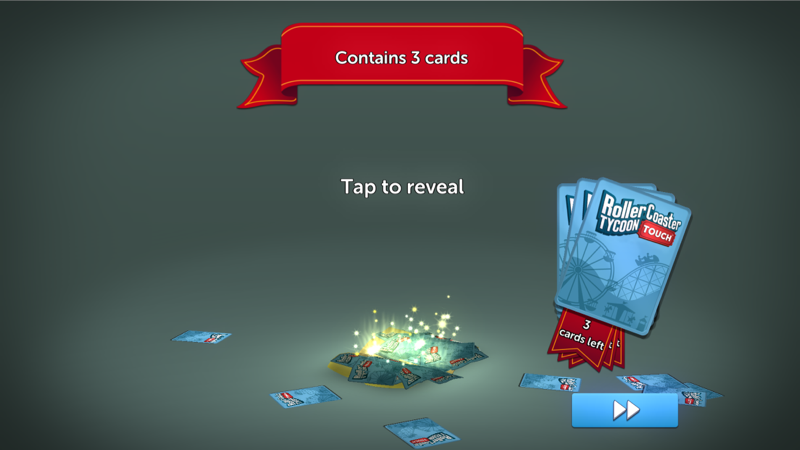 Cards are gotten with tickets or real-world cash. Also, Amazon and the Amazon logo are trademarks of Amazon.com, Inc. or its affiliates. Online Fanatic Copyright © 2019.